The nursing home industry has evolved into a multi-billion dollar business composed of major corporations in the United States. Unfortunately, in some cases, profits and the drive toward efficiency have taken precedence over administration of proper care to our loved ones. As the population ages and moves into various forms of assisted living, the more and more we hear about reports of neglect, abuse and exploitation. For most of us, the reports concern our grandparents, parents and loved ones who for one reason or another have relocated to such nursing homes. Is it any wonder that we feel outraged, concerned and helpless when such conduct occurs to someone we love and cherish; to someone who is sometimes afflicted with dementia or alzheimers disease or other neurologic deficits that make them ripe candidates for such abuse? At the Law Offices of Kevin C. Ford, we are here to help and champion the rights of victims of nursing home abuse and neglect in Georgia. Mr. Ford’s protected servicemark in Georgia is that “AGGRESSIVE ATTORNEYS GET YOU MAXIMUM POSSIBLE SETTLEMENTS” and that is exactly what Mr. Ford believes and practices in the representation of victims of nursing home negligence. When other attorneys are not interested or experienced to take your loved one’s claim to the next level and file suit against the major corporations for fair compensation, call Mr. Ford; unapologetically aggressive for you! Mr. Ford takes great pride in accepting each case and each client on a personal basis as it they were a member of his own family and steps into the ring and fights for you! Sadly, most cases of neglect and abuse involve elderly patients and residents either developing horrendous bedsores or falls that lead to serious and sometimes fatal complications. Tragically, most of these events would not occur but for the carelessness and inattentiveness of the nursing home staff. Sometimes, nursing home staff is overworked and under utilized in proper supervision of the elderly and their needs. More often, workers simply neglect to fulfill their duties to our loved ones under the law to disastrous consequence. Death can result from falls. Deaths which could have been prevented. Is it not time to hold the nursing home corporations and their employees accountable for their acts and omissions which cause harm? Bedsores can be life threatening to elderly residents and are more easily preventable than they are treatable. A bedsore is generally a painful skin ulcer that is caused by constant pressure on a part of the body where the blood vessels are cut off from that area. 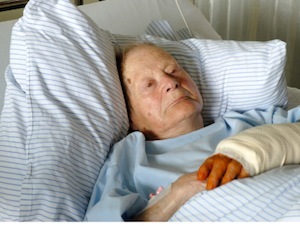 In nursing homes, bedsores generally occur when staff fails to reposition those in a wheelchair or bed, fail to provide proper skin care and/or failure to provide proper nutrition. For those residents in a wheelchair, it is advised that residents change their position every 15 minutes on their own and receive attention from the staff at least every hour for major repositioning. For residents in a bed, it is recommended that they are repositioned every two hours and that their bony areas are protected by cushions as opposed to being exposed to or against certain angles in the bed. For skin care, it is advised that skin be inspected and regularly cleaned. Additionally, the elderly may need help in regard in bowel/incontinence issues that require assistance with urination, regular diaper changes and moisturizing lotion. For nutrition, it is recommended that residents be provide healthy and fresh foods with any need dietary supplements and frequent fluid intake. The Law Offices of Kevin C. Ford are currently accepting nursing home abuse and neglect cases throughout Georgia Please contact us today for a free evaluation and consultation.